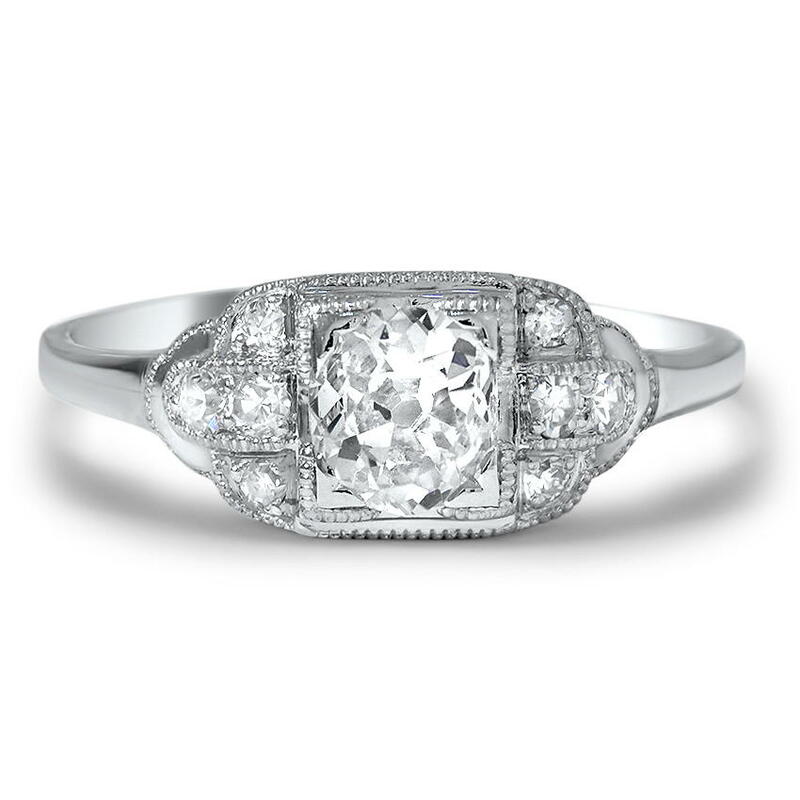 The past few years have seen more and more young women falling for engagement rings from the Art Deco era. With their geometric lines and dazzling sparkle, these designs often feel as fresh and contemporary today as they did almost one hundred years ago. 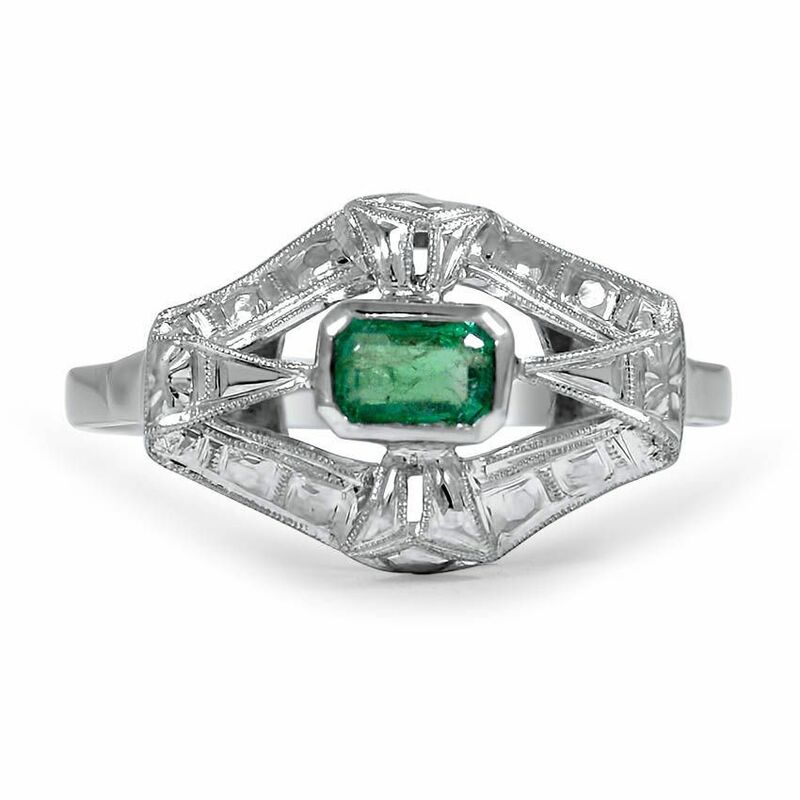 The Kalkora Ring captures the geometric sensibility of the Art Deco era. A dazzling old European cut diamond sits nestled in the center of twenty bezel-set single cut diamond accents. 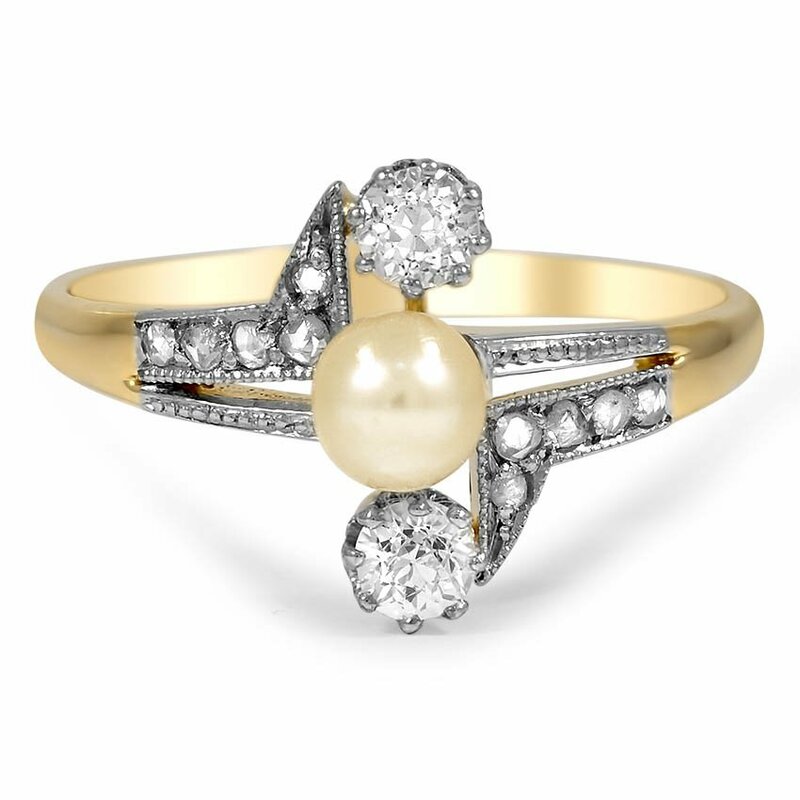 A round cultured pearl and two old mine cut diamond accents form the platinum centerpiece of the Elouise Ring, a mixed metal piece from the 1920’s. Five rose cut accent diamonds in each shoulder give brilliance and sparkle. The Triska Ring features two old European cut diamonds held aloft in a delicately detailed kite shaped head. The milgrain bordering, six old European cut diamond accents, and four French cut natural sapphires add to the appeal of this unique ring. 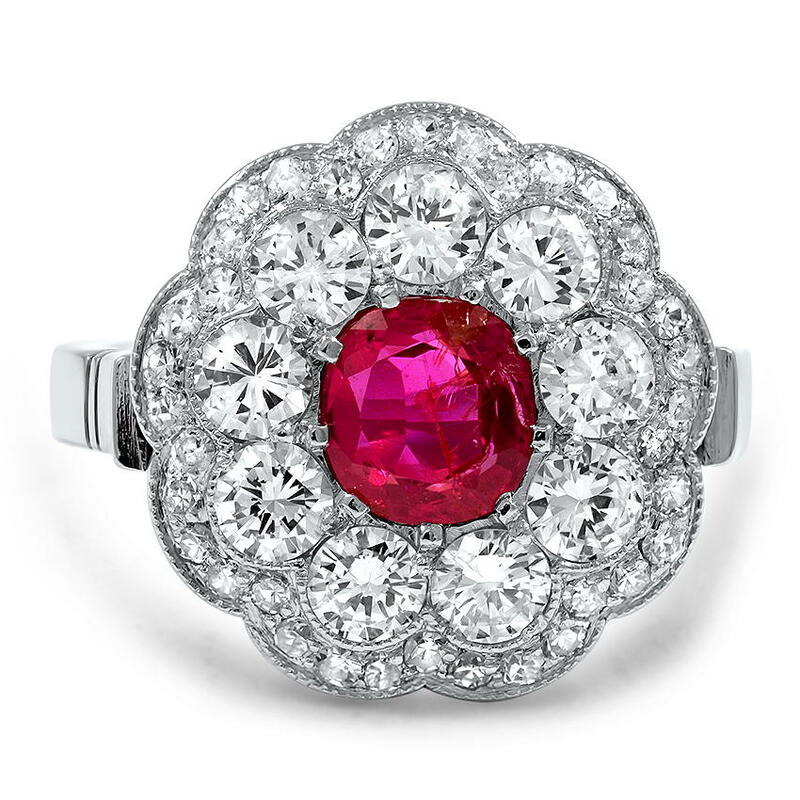 The Vedette Ring’s floral motif is carried out beautifully with an alluring cushion-shaped natural ruby in a diamond double halo with larger diamonds in the inner halo. 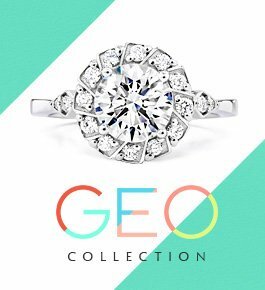 A sparkling old mine cut diamond takes center stage in the Shanti Ring, a charming 1920s ring with single cut diamond accents and milgrain detailing in an ornate top. 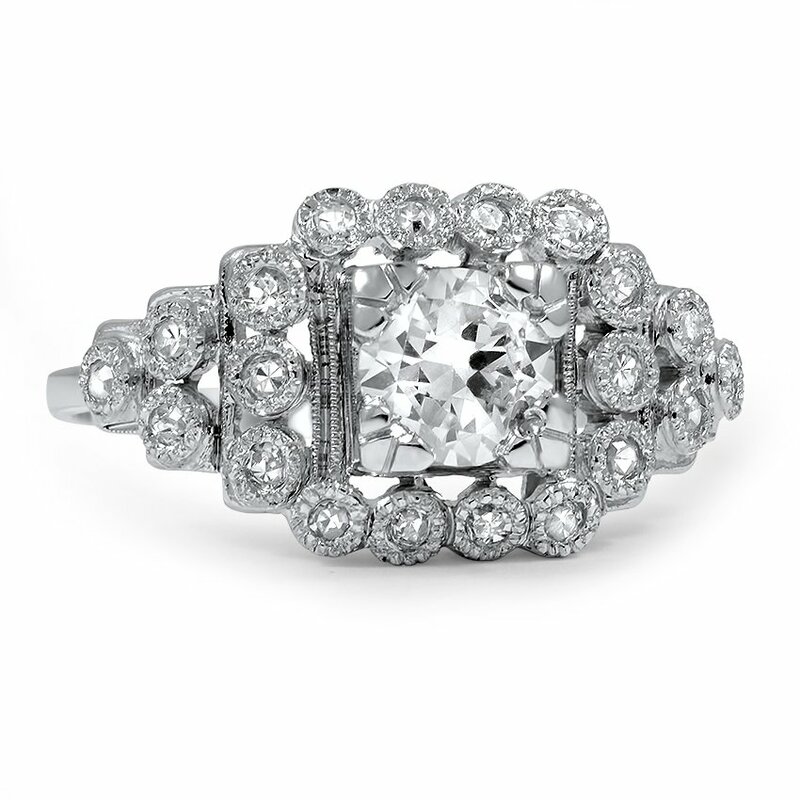 The Debbie Ring showcases an exquisite round diamond in a rhodium plated top. Diamond accents on each shoulder lead to the 14k yellow band adding intrigue to the charming ring. A vibrant green emerald shines from the center of the Marcelene Ring. The 18k white gold setting of this 1940s ring is adorned with milgrain detailing and pierced designs. 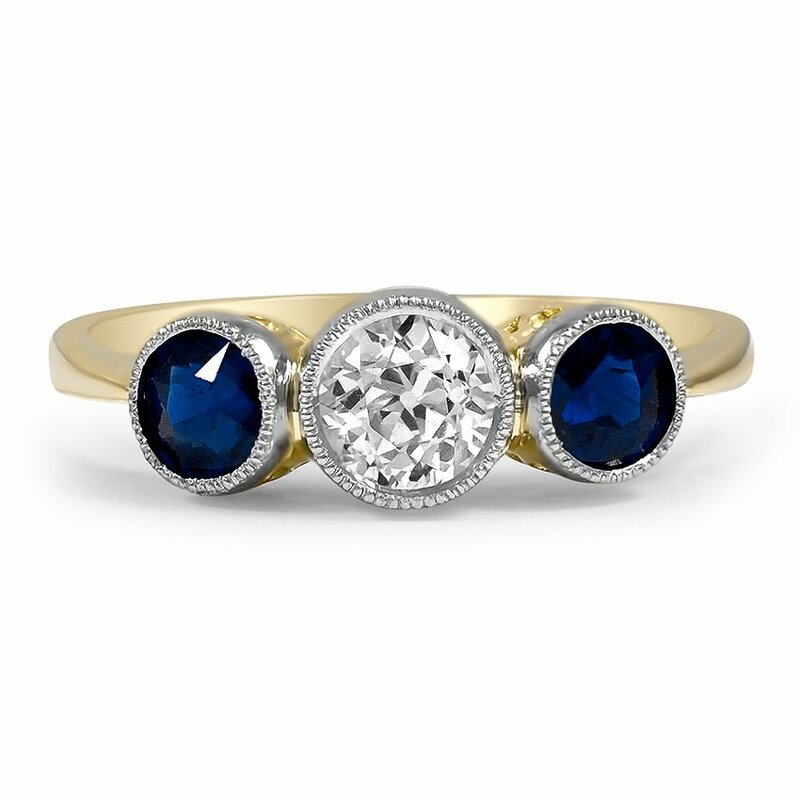 The Romona Ring features a classic three stone setting with an old European cut diamond center and two deep blue sapphires for a distinctive and unique look. 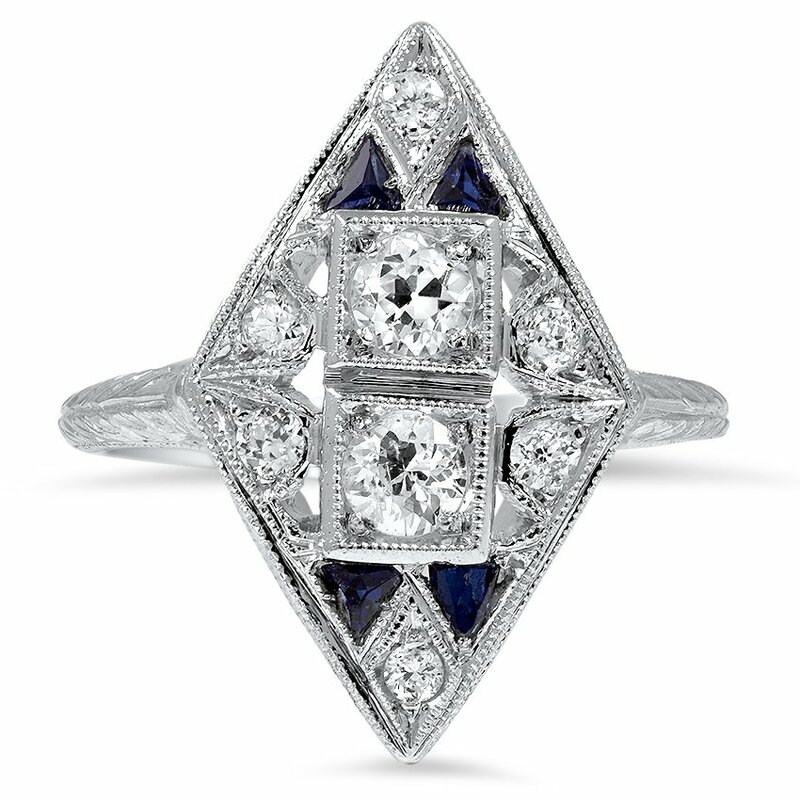 Do you love Art Deco engagement rings? Which of these rings is your favorite? Let us know on Facebook or Twitter, or in the comments section! 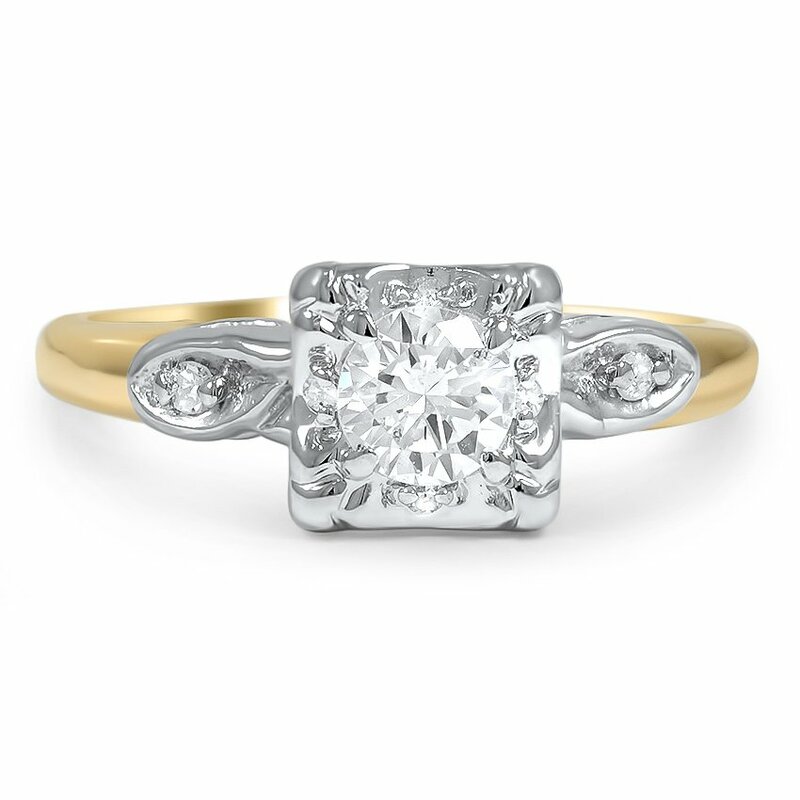 To see more stunning vintage rings, browse our collection of Antique Engagement Rings. I recently decided that I deserved to give myself a pre-retirement celebration gift after 46 years as a nurse. i chose a smaller (.9 carat) but quality Asscher cut diamond in a platinum Adorned Trio band. It is a colorless, ideal cut internally flawless, with 6 tiny diamonds flanking the stone. The Asscher cut is a square emerald like stone and is like looking into a crystal cave. Was worth going smaller to have such a spectacular diamond, and in a dark room, it somehow finds light and sparkles as though it has light from within. Best gift to myself, and worth the wait! THE FABIA IS MY FAVORITE. BUT ALL ARE BEAUTIFUL. SURE WISH I COULD HAVE ONE!!! Hi Donald, good question! 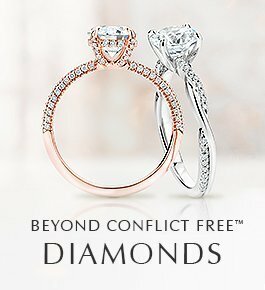 Check out our post on “mangagement rings” here: http://www.brilliantearth.com/news/creating-a-custom-mangagement-ring/. 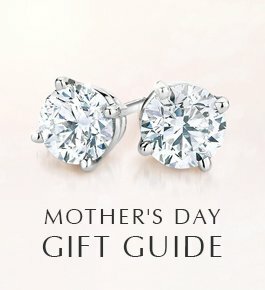 Our jewelry specialists would also be more than happy to advise you on purchasing a men’s engagement ring and answer your questions in more depth via email (http://www.brilliantearth.com/contact/) or at 800.691.0952. Thank you for your interest! WHAT DO YOU GIVE ANOTHER MAN FOR AN ENGAGEMENT RING? Tamiko is my favorite, simple but elegant. Love baguettes. Beautiful! The Fabia Ring is fabulous! Beautiful rings. Loved the Fabia. AM I the only one to notice that none used traditional yellow gold? I have to love the period of the 1920’s. So elegant, and as a man I think the women’s fashions were gorgeous and exciting. I also love the cars. It’s too bad that while their tastes were stylish, their knowledge of economics was imperfect. The Tamiko ring is definitely one of the most elegant I have see in a long, long time; a star! I love the Integration ring. My Mother left a platinum ring which was somewhat the same design. I put one diamond in the middle and two rubies surrounding it….stunning! I love Art Deco pieces. 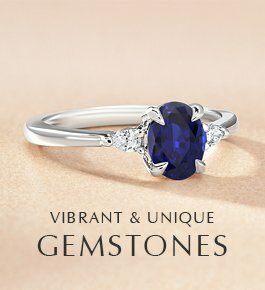 The Fabia ring is my favorite, except I would make the center stone a sapphire also. The Fabia – beautiful contrast of the sapphires nestled amongst the diamonds! The Hayleigh – gorgeous zircon (my birthstone) nestled amongst the diamonds and white gold! I purchased a 3/4carat 9 old mine diamond clustered ring with 18k gold band at an antique show for $400 back in 1980. Appraised for $1000 back then. Didn’t really appreciate the old mine diamonds until I read the comments here! The Fabia is definitely my favorite with the Wen a close second.. They are all absolutely gorgeous!! Hi Ernie, congratulations on your anniversary! 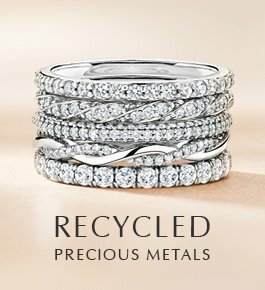 You can view our collection of anniversary rings here: http://www.brilliantearth.com/wedding-rings/. 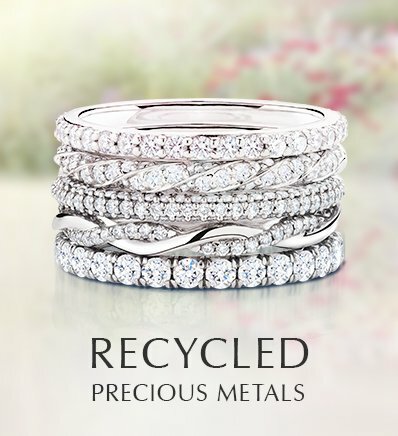 You can also view our extensive collection of eco-friendly jewelry here: http://www.brilliantearth.com/eco-friendly-jewelry/. Thank you for your interest! The “Fabia” and of course; the “Wen” are my absolute favorites of the collection shown (l’m September born, is there a contest in the works?????) . . . All are beautiful. The Tamiko is my favorite followed closely by the Fabia but they were all beautiful. i am looking for a 50th anniversary ring-any ideas? The Fabia and Wen rings are gorgeous and in that order!!! Old diamonds are the best. European, mine cut and transitional are all I check out when I buy on ebay. My ring is is a high mount, hand filed lacework around a miners cut…we found it in a pawnshop. Tamiko and Wen my favorites. Simple but elegant. I really love the old mine cut diamonds! They have so much life. I have my grandmothers’ two engagement diamonds and my original diamond sent in a band ring. The two old diamonds really outside my ideal cut flawless diamond. Same in a Deco brooch with all old European diamonds. Anyone else agree? But really, the emerald cut is my special favorite. So elegant! Thank you for this article! My mother has my grandmother’s Rani ring in her possession. 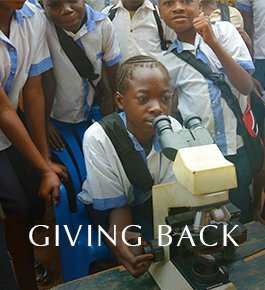 It is the only thing I have ever asked for, since I was a child of 10! 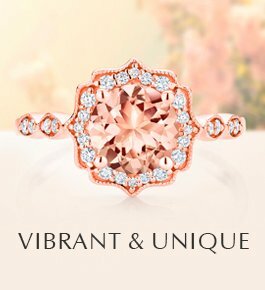 Love the Tamika ring fabia ring stunning and exquisite would love to see more. The Tamiko and the Rani are both beautiful….either would be my choice. Love the details of the Art deco engagement rings. Do they also have the wedding bands?